Regal Cake Rusk is a delicious double baked cake bar with a delectable crunchy and crisp taste, Traditionally eaten dipped in tea, coffee or milk. Can be a perfect start to the day as a quick breakfast, a speciality for teatime or for entertaining guests at any time. 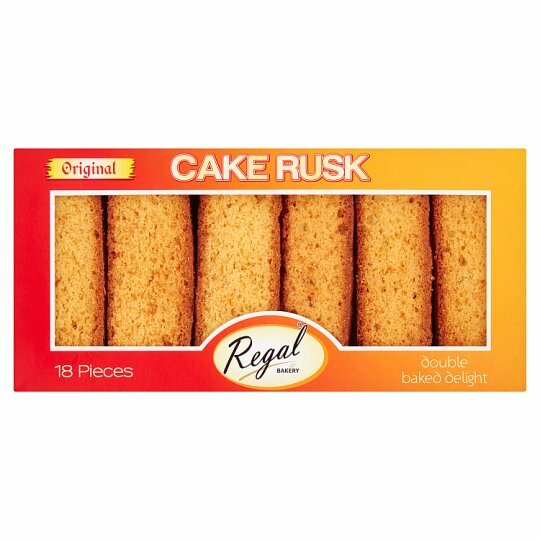 Regal Cake Rusk is manufactured using the finest ingredients, under strict supervision, to ensure its classic taste for your pleasure and memorable moments, if however you are not completely satisfied please return to the customer services manager stating when and where purchased. Your statutory rights are not affected.